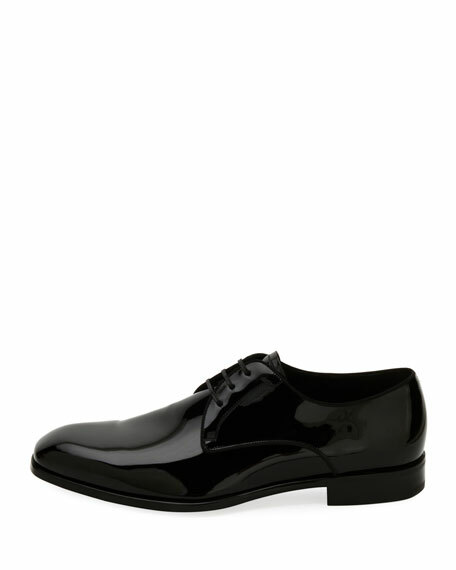 Salvatore Ferragamo dress shoe in patent leather. 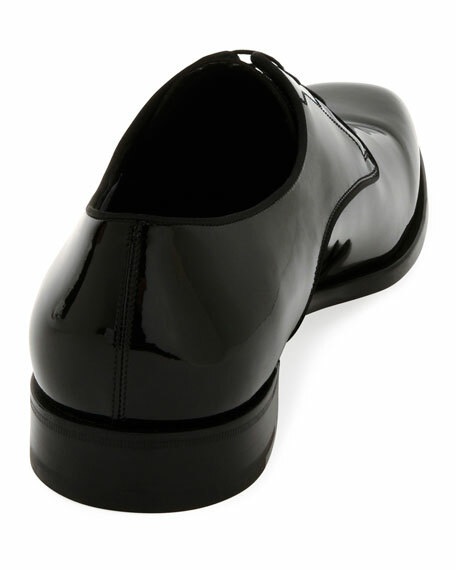 Salvatore Ferragamo "Achille" unlined rubber sole driver with gold hardware. Apron toe. Notched vamp. Gold Gancini bit across vamp. Slip-on style. Rubber sole. Cow leather. Made in Italy. Salvatore Ferragamo leather high-top sneaker with logo text graphic design. 1.5" flat heel with molded Gancini detailing. Round cap toe. Salvatore Ferragamo leather high-top sneaker with logo text graphic design. 1.5" flat heel with molded Gancini detailing. Round cap toe. Lace-up vamp. Grip-strap collar. Padded footbed. Rubber outsole. "Ayr" is made in Italy.